The RedShift Dual-Position Seatpost is unique because it allows the rider to change the fore and aft saddle position while riding, with the goal being to give an optimal position when riding on either the drop bars or the aerobars. Dropper seatposts allow mountain bikers to raise and lower their saddles for different types of terrain and have become very common over the past few years. Could a similar thing happen for ultra-distance cyclists using something like the RedShift seatpost? This is a lengthy review, so use the shortcuts below to skip to the section that you’re most interested in. The brief summary is that I found the RedShift seatpost to be well made, to function admirably and to increase comfort when using clip-on aerobars on a typical road bike. There may be some compatibility issues with certain bikes and accessories. First, why would you want to vary the position of your saddle while riding on the road? The main reasons are aerodynamics and comfort, which are both important criteria for ultra-distance cyclists. Time trial and triathlon bikes are built with seat tubes that have a far steeper / more upright angle than normal road bikes to allow riders to place their saddle further forwards (with less setback / offset) compared to the crank axle. This allows riders to have a lower and more aerodynamic arm position without needing to bend at the hip any more than someone who has their saddle further back and their bars higher – the entire body is rotated forwards without changing the joint angles. Governing bodies have rules about the minimum amount of saddle setback, which is defined as the distance that the nose of the saddle is behind the crank axle. To push the limits of these rules, after a brief period of mechanics sawing off saddle noses, saddle brands now offer stock short-nosed models so that riders can use a more forward seating position without violating any rules and without having to perch uncomfortably on the nose of the saddle. Since ultra-distance bike races have no such rules, why wouldn’t ultra-distance cyclists want to have a seatpost that puts the saddle as far forward as possible all the time? The reason is that ultra-distance road cyclists tend to use drop handlebars with aerobars mounted to them and frequently switch between the positions. When using the drop bars, moving the saddle further forwards than standard is not ideal because the center of gravity shifts forwards and more weight must be supported by the hands. The change in weight distribution not only negatively affects bike handling and braking capabilities, but more importantly pinched nerves in the hands are even more likely to be a problem, which is already a major concern for many ultra-distance cyclists (see the Hand Comfort page). These concerns are not important when using the aerobars because they are not used when fine bike handling skills are needed and the weight of the front of the body is supported by the arms and elbows when on the aerobars, not by the hands. It therefore makes sense to have the saddle further forward when riding on the aerobars and further back when using other hand positions. The RedShift Dual-Position Seatpost is currently the only product that allows such a change to be made on the fly, while riding. 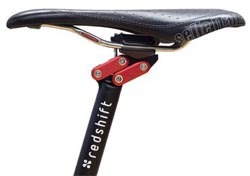 So, the theory makes sense, but does the RedShift seatpost work? To move the saddle between the rearwards and forwards positions, it’s enough to stop pedaling, unweight the saddle, grab the nose and give it a firm pull or push. It’s a relatively easy and quick process, but does upset the riding rhythm slightly so you don’t want to do it too often and not when there’s traffic around because it can cause you to waver. There is no way that the post could move by itself while riding because to get between the two positions it travels in an arc that requires it to go up first and there is also some mild mechanical resistance to the movement. Many of the popular models of dropper posts used on mountain bikes don’t work perfectly unless they’re setup correctly and well maintained. Fortunately, the RedShift post is far simpler and works smoothly every time with no special setup or care needed. I’ve seen many seatposts that have integrated suspension that are very poorly made and quickly develop play. Fortunately, the RedShift post is engineered and manufactured to an extremely high standard so I have no concerns about it developing any play and it doesn’t move at all once it’s in position. The post only comes in a 27.2 mm diameter, which is relatively common and there are shims available to make it fit in nearly all frames that use a round seatpost, but unfortunately many modern road frames use proprietary seatpost designs where this wouldn’t work. The saddle clamp is only recommended for saddles with round rails (most carbon saddle rails are oval). The post gives a 5 cm difference between the forwards and rearwards positions. The rearwards position is equivalent to having a seatpost with 16 mm of offset. This is quite typical for road bike seatposts, which tend to have between 10 and 25 mm of fixed setback. The forwards positions puts the center of the saddle clamp 34 mm in front of the center of the post, so gives an effective change in seat tube angle of 3 to 4 degrees (depending on saddle height). The position change therefore approximates the difference between a regular road bike and a regular TT/triathlon bike. Although the two post positions are fixed, the saddle setback can be fine-tuned because the saddle can be moved slightly within the saddle clamp, like on any other post. The saddle height (from the bottom bracket) remains the same in both positions. It’s possible to vary the saddle angle between the two positions, with the nose of the saddle being 1, 3, or 5 degrees lower when in the forwards position. The 1 degree setting worked well for me. At 402 grams (as measured by me, officially 400 grams) this post is about 150 grams more than many decent-quality seatposts (which are in the range of 180 – 280 grams). I’m fine with this level of weight penalty if the products is useful and if it allows me to use a more aerodynamic position for a higher proportion of time or to be more aerodynamic in that position because then the slight weight penalty will be easily made up for with the reduced air resistance and it will make me faster overall. The post does cause some compatibility issues with certain bikepacking bags that attach to the saddle and seatpost, although not all such bags. 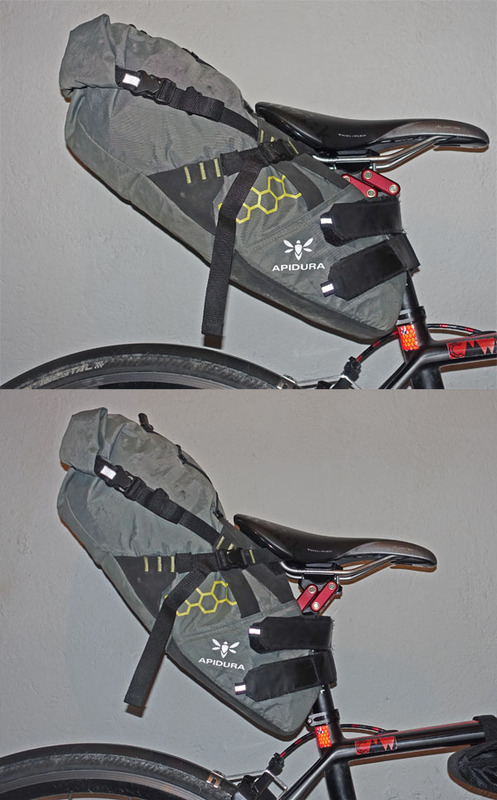 I’ve tested it with a medium Apidura bag and as long as the saddle isn’t all the way forwards in the saddle clamp and the bag is not filled with too many heavy items then the post still functions fine (see the pair of images on the right). The post will work fine with any bags that are designed to be compatible with dropper seatposts (like the Porcelain Rocket Albert). It won’t work with certain bags that have integrated anti-sway systems that attach to the top of the post like the Specialized Burra Burra or any bags that are reasonably rigid (e.g., my Topeak Mondopack XL caused problems). Personally, I prefer to have a bag that I can access easily, has multiple compartments and doesn’t sway around, so I use a rack-top bag which obviously isn’t affected by this post. I often put extra water bottle cages behind my saddle, on a mount that attaches to the saddle rails, and again this is not a problem with this post. So, from a mechanical and functional point of view I’d say that the post is excellent as long as there are no compatibility issues. What about from a practical point of view? I set my saddle to have my standard setback when in the rearwards position, so riding in that position felt exactly as it always had. This aluminum post replaced a carbon seatpost but I didn’t notice any change in comfort because tire pressure and saddle padding have far larger effects on comfort and differences caused by the frame or seapost are generally marginal and hard to detect. When moving the saddle to the forwards position and using the aerobars the first thing that I noticed was that my aerobar extensions were now too short because my elbows had shifted forwards, so I had to purchase some new aerobar extensions and left them a few cm longer. When on the aerobars, I certainly noticed the advantage of having my elbows further forward and my weight being supported more by my skeleton instead of my muscles, which made holding the position easier, more comfortable and less fatiguing. I wanted to maintain the same riding position when using the drop bars as before, so I chose not to lower my bars when installing the post. 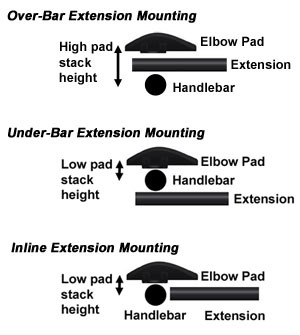 My elbow pads are already slammed down as low as they can go on the bars (as shown in the ‘Inline Extension Mounting’ version in the image on the right), so I couldn’t lower my aerobar position as some people might choose to do to take full advantage of having a more forwards saddle position. Because my shoulders remained at the same height, changing the seatpost has not directly affected my aerodynamics. However, the improved comfort and sustainability of using the aerobar position allows me to stay in that position for longer and so it yields indirect aerodynamic gains. Some people report increased comfort when using the forward position of this post due to the opening of the hip angle causing less compression in that region. Because I use relatively short cranks (165 mm cranks with a 705 mm saddle height), my knee doesn’t come up particularly high (which I find helps to prevent knee problems) and so my hip angle is not really an issue regardless of my saddle position – it’s always quite open. The 5 cm difference between the two saddle positions mimics the change in frame geometry between typical road and triathlon bikes, but this is the one thing that I’d like to change. I’d prefer it if the difference was about 3 cm. The reason for my preference is that on most rides I’m not typically able to stay on the aerobars constantly for long periods and then use the hoods and drops constantly for a long period. Instead, I fluctuate between periods when I’m mostly on the aerobars, but changing frequently, and periods when I’m mostly using the hoods and drops. I found that having the saddle 5 cm further forwards is ideal when using the aerobars, but it compromises bike handling and comfort too much when I briefly use the hoods or drops. When such periods aren’t long enough to warrant moving the saddle, I felt that my position was too compromised and it would be better if the change was only 3 cm so that my aerobar position is still better (although maybe not perfect) but that the position when I briefly go back to the base bars is also reasonable. However, this may be partly due to most of my riding being on my local Swiss roads that are nearly always undulating and frequently passing through villages, so I change hand positions relatively frequently. In other regions where road conditions and therefore riding position changes far less frequently, I’d probably be happy with the full 5 cm change in saddle position. Another experienced user of the post told me that he felt the opposite and wished that the difference was more like 7 cm. Maybe in the future RedShift could offer different versions of the seatpost to accommodate individual preferences and riding styles. In addition, the amount that the 5 cm change in saddle position makes to joint angles depends on saddle height, with the relative change being greater for someone like me who has a relatively low saddle height and slightly less for a taller person with a higher saddle. Unexpectedly, using the RedShift seatpost made me realize how often I grab the saddle when maneuvering my bike by hand. When grabbing the bike by the saddle, at first the saddle alone moves instead of the complete bike, which felt odd until I learned how to compensate for it or grabbed the bike somewhere else. If using clip-on aerobars on a regular road bike, it certainly makes sense to have two different saddle positions available. The RedShift Dual-Position Seatpost achieves this goal extremely well and is very well designed and manufactured. There are some compatibility issues which mean that it won’t work for everyone (frames that use non-round posts, carbon saddle rails, and certain seatpost-mounted bags can all cause problems). Some people might not like the chunky look of the post, but I always value function over aesthetics and I think it looks fine. It’s also available in all black as well as the version with red pivots. I found that it certainly improves comfort when using the aerobars. It also improves aerodynamics either directly by allowing for a lower shoulder position with the same hip angle and/or indirectly by making it easier to stay on the aerobars for longer. The post has been used by several other ultra-distance riders, and the feedback that I’ve heard from them has always been very positive. The price of US$180 (without tax) is relatively high, but is justified due to it being a low-volume item that is extremely well made. Whether this cost can be justified has to be a personal decision. Given the increasing popularity of MTB dropper posts, many of which cost US$300-$450, I don’t see the price as being a major obstacle. If you want to save some money then sales and discount codes are sometimes available. RedShift components are available in Europe from 3sports.de, where the seatpost currently costs 185 euros (including tax). This seatpost has been listed as a possible solution on the Riding Position page of this website for more than a year, but I hadn’t been able to try it myself. I therefore contacted RedShift and they kindly agreed to give me one to test, but I tried to not let this influence my opinion. Interesting: I used one on TCR4. It has lots of things going for it, but don’t use it any more because I found that the forward position didn’t put my saddle quite high enough and could cause knee problems. That’s interesting, I measured the saddle height in both positions and the distance from the bottom bracket was identical. Having less setback does require a slightly different combination of muscles though, so I expect your knee pain was more likely to be caused by that than by saddle height. Interesting review of an innovative product. I appreciate you said that it takes a positive action to alter/swing the saddle position, but is there any hint of a suspension effect? There must be a small amount of give? I had somewhat expected that too, but there is absolutely no give or play whatsoever. Once it’s in one position or the other, it doesn’t move at all until you deliberately push/pull it. I would be curious to know what you would think of Fred Bars (https://www.sirenbicycles.com/products/fred-bars) as a possible alternative to this seatpost. Obviously, this only decreases the reach without altering the effective seat tube angle/saddle setback and thus decreases the hip angle instead of rotating the body forward, but it’s not clear to me how important that is. I am considering using the dual-position seatpost in conjunction with a Fred Bar to setup a comfort oriented aero position on a full suspension trail mountain bike (which already has a fairly aggressive effect STA at 75.5 degrees, but a long reach, as is fashionable for modern trail geometry) for a Tour Divide run.